The educational resources on this site are current, reliable and research-based. You won't find gimmicks or tricks--only science-based information that makes sense and works! English, Spanish, Arabic and Russian language versions on one DVD for $10 plus Shipping & Handling. There is no shipping and handling charges if you are able to pick it up in our office. Videotapes are $3 each (plus Shipping & Handling if mailed). Choose English, Spanish, Arabic or Russian. Continuous loop English versions are also available. There is a 10% discount on orders of 10 or more to same address and a discount on shipping. Call 402-441-7180 for multiple orders and pricing. 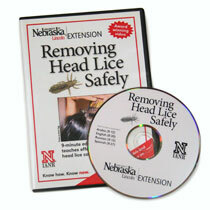 Also included with each order is a printed "Quick Guide for Removing Head Lice Safety" with combing instructions.